Mickey and Ryan Krivosh in front of the courtyard to Three Birds Restaurant. Winner in Best Patio. If there is one thing we have come to learn about Lakewood in this issue of the Observer, it is that in only 5 square miles we have a great abundance of places to get good food, and plenty of opportunities to eat it outside on some of the area's finest patios. Leading the voting in a recent Lakewood Observer poll were two restaurants with the same owner. 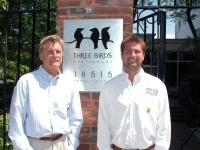 First is Three Birds, under new ownership by Mickey Krivosh, with one of the classiest and largest patios around. Then came the incredible patio complex at Around The Corner, also a Krivosh family establishment. Although very different in concept, both restaurants are known for excellent food and drink. In a recent interview about the ownership change at Three Birds, Mickey made it clear that the head Chef, Rachael, will continue creating her award winning meals and will be throwing some new flares into the mix. This is great news for the fans of Lakewood’s only 4 star restaurant, who had feared the sale would mean drastic change. “I want to continue the great work Jim Bell did at Three Birds, and build it into an even finer dinning experience.” And with some of the ideas Mickey is talking of, a 5 star rating is not out of the picture down the road. Other venues that ranked high in the voting were Pacer’s, The Beer Engine, Sullivan’s Irish Pub, Beck Cafe, 5 Guys, Player’s, India Garden, Lake House, Sweetwater and Dairy Queen. 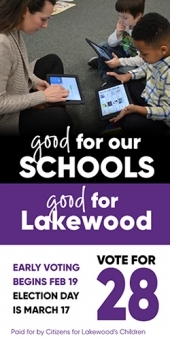 While it sounds like that should have covered most of Lakewood's patio dining options, it is not even close! 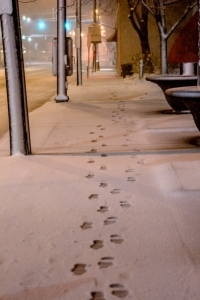 There are tremendous patios on the east side of Lakewood at Shamrock Tavern, Tarrymore, and even Sugar Bears. In the center of town one can watch the world go by at Chipotle, Melt, and soon at the new patio restaurant at Rozi’s Winehouse. This last patio is under construction right now, but soon you will be able to enjoy many of the fine dinning offerings previously only available at their wine tastings. If patios are not for you but you like to eat outside, try grabbing some food and sit down to enjoy it at one of the many parks in town- The Place To Be is next to Issac Warren Park, six restaurants surround Sinagra Park, and bela dubby, Manja, Mahalls, Coffee Pot, Babba’s are all close to Madison Park. With only 5 square miles, practically every restaurant in this city is close to a wonderful place to enjoy your meal outside in the sun and fresh air. So no matter if it is The Westend Burger to-go, or something from the newly opened Jammy Buggers, we need not worry about getting fed in the city of Lakewood.